and adjust the 30-365 variable capacitor and also adjust your radio tuning. To construct this antenna use #35 enameled copper wire and wound 16 turns on a square measures 15 inches on a side and 1.5 inch wide. 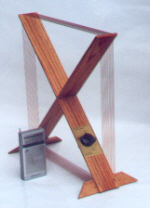 This antenna will cover full AM standard broadcast band from 550-1700 KHz. Copyright 2013© CircuitDiagram.Org. All rights reserved.